From time to time I like to do a full AI evaluation to see where a given game is. The reason I started programming in the first place was to write AI. 25 years later, we have Crusade. So how does it stack up? I've scored the other AIs Stardock (or I) have developed over the years and I suspect my literal score changes slightly due to faulty memory. But here is where I see the various GalCiv games. BTW, while the score is 1 through 10, it is not a linear quality bar but rather more exponential in nature. That is, a 6 is a lot better than a 5 and so on. A 5 would be what I'd consider "game industry acceptable for the genre". 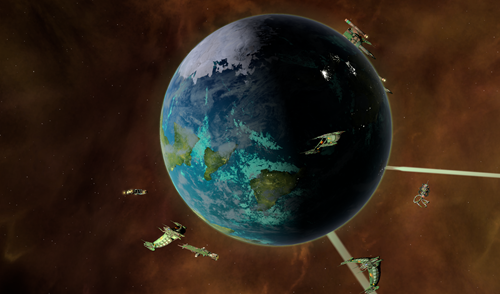 I may have some bias against GalCiv III's AI since I didn't write it. I consulted on it. 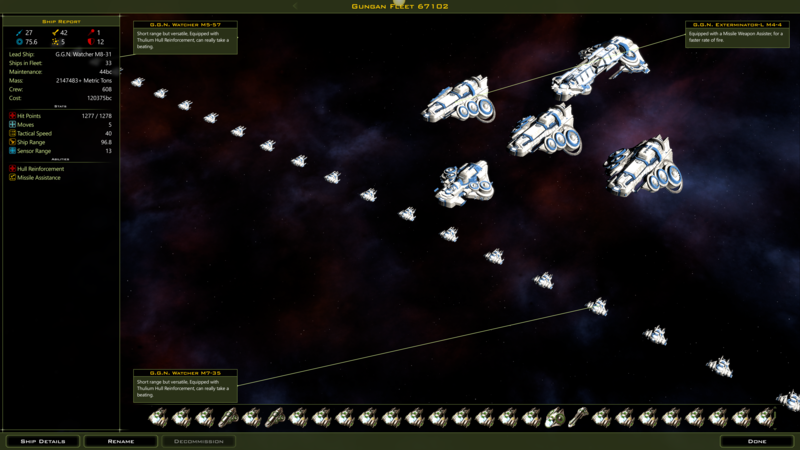 I did work on the GalCiv III 2.0 AI which is where I started to learn the architecture. With Crusade, I implemented a multi-core AI (AI jobs get spun out to the least busy core which is why turn times are fast...and why you get stuck turns). Can beat most players on normal without cheating (and no, it can't see everything, 18% of its turn CPU time is spent figuring out what it can see or guess things based on my knowledge of how the map generation is done -- something an expert player would notice too). Is REALLY good at trading overall (and yes, I just fixed that ship cost thing, very annoying). It is quite good at military engagement. Incredibly wasteful with administrators. No one needs refunding from constructors more than the AI. Not good at finding detours to get to a destination to route around problems. 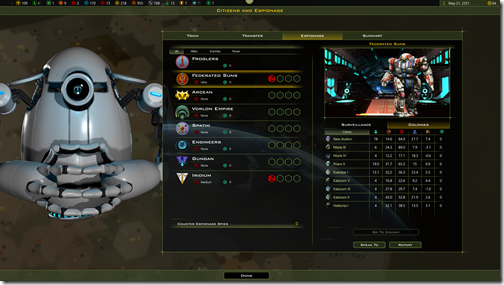 I wish GalCiv had a way point system. hint hint. Still new to the promotion system, doesn't use Commanders well yet. Still new to the global economy, doesn't use leaders well yet (still better than most players). Still learning the new tech tree system. I would like to have the game send me your data but the PR people say we could run into issues. But if I knew what paths 100,000 players were using, the AI could start using it. Let's check in on an AI vs. AI game on turn 500. So Jar Jar is allied with the Engineers, the Vorlons and the Irridium Corporation but at war with the Arceans, Federated Suns, and the Spathi. 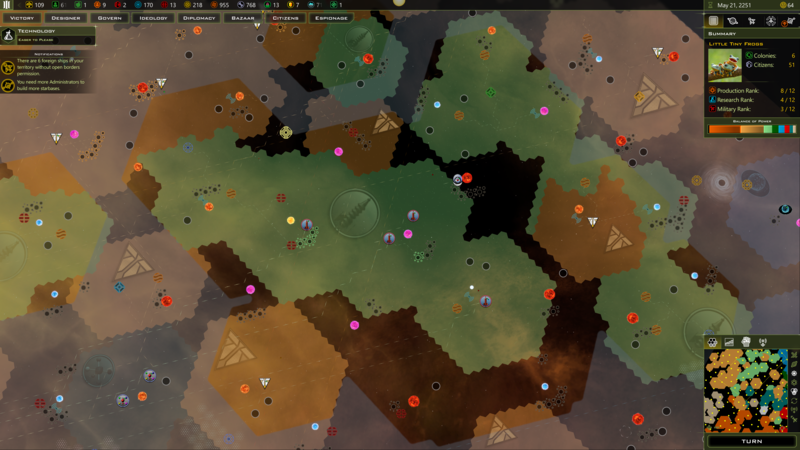 So there's a big galactic civil war going on here that my race, controlled by AI, has stayed out of. Many of the good asteroids are not being mined. However, he only has 109 billion credits (bc) to work with so there may be a reason. 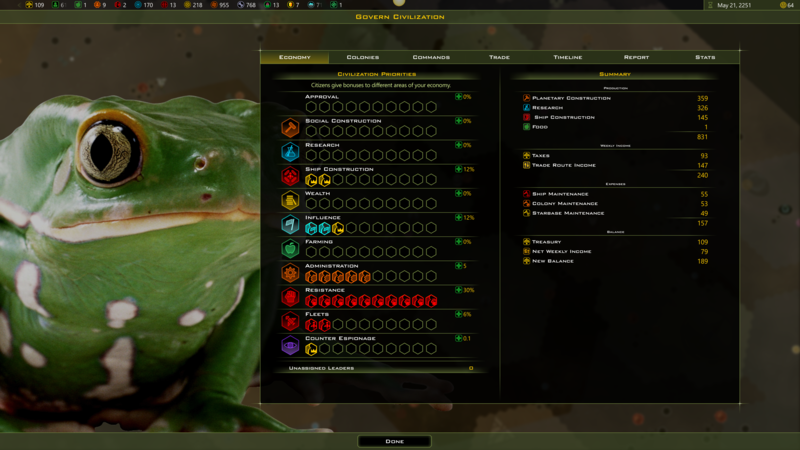 I'm playing as a Xenophobe, Colonizer which, in my build, means a 100% boost to research and social construction and a 50% drop to ship construction and 1 admin point per colony. Here, he's moved his leaders in a way that seems reasonable and is making 79 bc per week. Definitely did a nice job laying out the planet. I don't know if I would have built the preparedness center and probably wouldn't have built the market center. Currently stealing tech from the Federated Suns. Gungan fleet is no joke. So overall, it's looking pretty good. But...it can get better. A lot better. And over the next two years, in free updates, it will continue to get better. I can give pretty objective feedback on this. 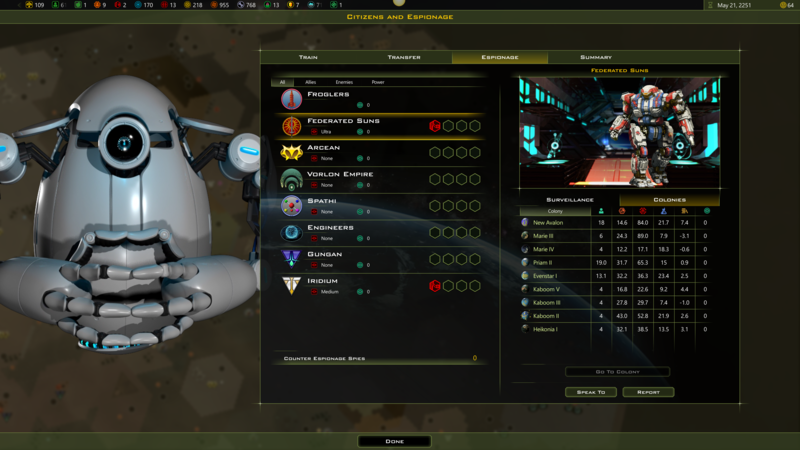 The original Galactic Civilizations AI caused me severe problems at the standard non cheating difficulty. I tended to lose. 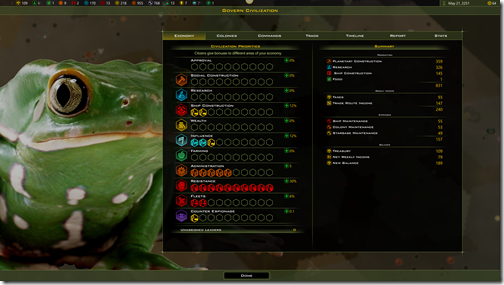 In Galactic Civilizations II, I could abuse the poor handling of the differing damage types and beat normal AI just fine, but it would still kick me to the curb at higher levels. In it's current iteration, along with pre-Crusade improved vanilla AI, Gifted is really easy, even though it's clearly a cheating whore and can somehow afford to rush build multiple colony ships 10 turns in. If it's really a 7, either I was just too dumb to play the first two and this iteration is simplistic by comparison, or your estimations of the earlier levels are a wee bit low and the first should be somewhere around a 10, the second an 8 or 9. - a home system with at least 2 asteroid groups. Evasion: with tacBoosters it is now very available, but the aI does not really react to it. Evasion can currently be used to completely circumvent other defenses. I only tried normal so far and took a peak at genius. at normal I outpace the AI by leaps and bounds with my two custom civs. On genius I don't see how to outplay the AI without exploiting a couple of things. Would it be possible to build this as a voluntary Opt-In system? I'd happily opt into this. Also, something against the current Crusade AI, doesn't value tech strategically and tends to trade tech way too easily to other AI, even when it is not in their interest (the Drengin have no business trading weapons or slaving technology to Benevolent civilizations). This isn't seen when Tech Brokering is banned which leads me to not believe Espionage luck is in play. This is something that the previous AI's did get right in II. What does that mean? Does that mean it is good or has some advantage during actual battles or is it prosecuting a war in general? What about above normal, does it still see everything then? Because it used to, and it was fairly easy to see during the colony rush. Give us some time to learn it! Make it optional, and prepare a very short statement about what kind of information you collect from us. Don't go the EULA road where I'm supposed to read 7-8 pages of legal text (for the short version) in a language that isn't my own to decide if I should install the software or not, please. I know lawyer like these long forms and they have an aversion for bullet point lists, but I think it's clear and concise: what you collect, what you don't. And make sure you don't change your code on what you collect without re-requiring consent, because that is PR nightmare, really. EA is using such data to monitor some multiplayer games (they did it with Mass Effect 3) to try to balance the game a little more. I don't know if Steam and the other services you sue allows you to collect that kind of information, though. An opt-in data sharing would be something I would sign into in a heartbeat. It was always my expectation that GalCiv would be using our own cleverness against us. Or should I say everybody else's cleverness against me? Yeah, that sounds right. Seconding this. Opt-in telemetry is fine, especially if there's a way to verify what data is being sent. I give the AI props for effort. It is clearly embraced hub and spoke. However the problem is that it spent so much effort on the wrong hubs. The planet has decent sci output, but only bc of the bazillion scientists- tile output isn't up to snuff. The main issue is that the bulk of the planet tiles are dedicated to social output while the bulk of the citizens are dedicated to sci. 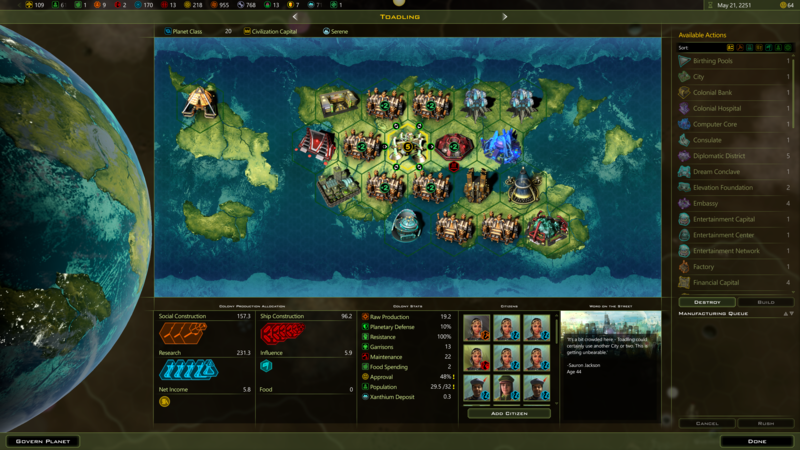 This is a problem when you consider that a civ only gets one computer core. Which should have been the most prioritized hub for this planet. The important star port was left neglected; and with plenty of trivially better spots for it. Surly one of them must have been available pre-terraforming. Also, the central mine is also a worse hub than the space elevator yet the AI built more factories around the bad hub than the good ones. Some tile bonuses (resistance) are worthless and should be ignored, or even removed since they are the worthless ones are uninteresting to me as a player and apparently sub-optimal for AI. (B.1) AI buys merc ships and sells to me for less than they paid... other war ships seem pretty cheap too. (B.2) I can cripple the AI by buying up all their survey ships + constructors + troop transports while at the same time accelerating my growth bc I don't have to spend citizens on administrators or generals. The ships are worth far more than their war/manufacturing value. Also the AI will doesn't seem to understand when a tech will be nearly worthless to them, and thus will research and trade for worthless tech. For example trading for additional ship range on a small map mid & late game when ships can already go anywhere on the map, extreme worlds after they are all colonized, silicon life wanting farm tech. Like other obsolete tech-they shouldn't be willing to pay much for this stuff. The squeals are more complicated games so it isn't too surprising that the AI struggles more understanding them. The current AI clearly understands a lot more than it did in galCiv 2. Re why was the OS/2 version better at AI? 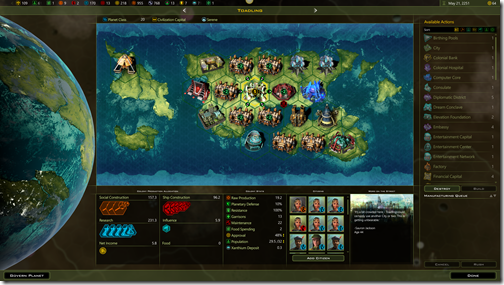 Primarily because it was the only GalCiv game that I designed and programmed and thus the AI and the gameplay were in perfect sync. In Crusade, for instance, look at the tech trees? If you're an AI, how do you pick what's the best one and do it in less than a 15ms? Ship design is another one that is really tough to deal with. Nowadays, most gamers don't appreciate AI or don't know what it is (exploiting a trade UI isn't AI for instance). The OS/2 version also had a primitive expert system. I stored data between games that set up what kinds of things you did in previous games and then used them against the player. I thought the game already collected telemetry? A year a go, I thought you had given up on AI. Really glad to see that you haven`t and are still working on it. as long as you do, I`ll follow and purchase (within reason). I start up the game, put in the fow and god cheats and just observe what the AI does (the point being figuring out which screws to tighten to improve it for a mod). Both (!) constructors bee-line towards a spot with 3 ressources and 2 relics, which is way outside their vision range. What is interesting about this? 1) Both constructors go to the same spot and one retargets just after the spot is taken. Not quite so bad but it tells you there is something weird going on with the AI handling the two starting constructors. 2) Fine example of SD's AI not maphacking, since it has only knowledge about how the map was created... Guys (SD)... If you don't call this cheating you are arguing semantics. It would be really appreciated if the AI was at least somewhat dependent on scouting (in the early phase). 3) The decision of sending both starting constructors for ressources was WRONG. In the current balance the best thing you can do with starting constructors is claiming asteroid mines in your homesystem asap (at least one constructor). The diminishing returns are huge. Asteroid mines fit a nice role at the moment. They are highly efficient, but also risky, they can be destroyed by pirates and early attacks of other empires. 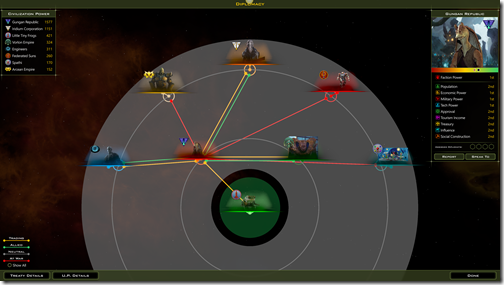 Since starbases and planets are hard to attack early on, asteroids being targets, by which you can hurt an enemy are the only thing keeping early war from being obsolete. They make the choice of early warships relevant. If they don't allready, I think privateers should be able to attack them. But this also means the AI can't just treat it as a sideshow, taking them when there influence has spread enough. It has to actually identify their value. and conclude that it can't use promethion or ascencion points that early, but it will get a lot out of putting up a starbase near the asteroids in the home system and neighboring ones. This also makes ressources (especially durantium) a lot more valuable, if asteroids are next to it, since you can then deploy the mines rather quickly. Another consequence of this is, that all starting systems should have at least 2 asteroid groups. A third note is, that constructor starts needs some looking at. I can see rush buying a shipyard and a constructor directly after, is being somewhat balanced against rushing a space elevator for example, due to cost. I can't say the same about 2 constructors being balanced against the other 4 starting ship variants. Crusade is definitely improved in that even on incredible I won easy every time before, but now if I have a rough starting spot incredible is usually a serious challenge that I'm not likely to win (however if my spot is lucky it's just a good match, though little chance of losing). I understand your points, but disagree. While the power of a few early asteroid mines cannot be denied, I don't consider it worth spending an Administrator on. I suspect that we are talking significantly different map settings being used here. I don't think it is an absolute strategy for all conditions, but could be one for the AI, as well as many people, to consider. To my understanding, the telemetry being discussed is not about seeing AI behavior patterns, as you were doing, but about getting a usable summary of human player behavior to base future AI development on or to feed procedural AI decisions. It is not about what the AI may or may not be doing now. So I do not understand what overall point you are making about "results" in this context. The problem actually runs even deeper. By now I also observed the AI not claiming asteroids, which are accessible to it by turn 2 due to influence growth and the asteroids being directly adjacent to the homeworld. I suspect that we are talking significantly different map settings being used here. I don't think it is an absolute strategy for all conditions, but could be one for the AI, as well as many people, to consider. I run the default settings for galaxy creating. Large maps with suggested amount of players. For the test it was a tiny map with 1 opponent. I would hope the AI is somewhat optimized for those settings. While the power of a few early asteroid mines cannot be denied, I don't consider it worth spending an Administrator on. You can usually grab 4 or more mines (quite frequently while also claiming a ressource or two to boot) before turn 10. That's effectively a doubling of manuffacturing, research and wealth. 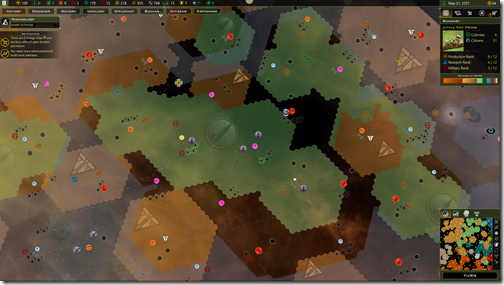 You are less reliant on rush buying on your homeworld and can kickstart your colonies faster with that money. The research points enable you to squeeze in an administrator tech or two, when you need them. I can't really imagine a scenario where dumping one or two admins on early asteroid mines does not pay off. It just gets you ahead all across. And here I haven't talked about the fact, that those are my starting ships yet. So they effectively added 2 admins in the first place. One of us is missing the point. To my understanding the telemetry is supposed to be used to see what are efficient human player strategies/ behavior patterns, which are to be used to improve the AI behavior patterns (maybe even train a neural network or other fun stuff). My point is, that this is not even necessary for making significant AI improvements at this point. The AI is currently not set up in a way, that makes it 'understands the balance of the game' (e.g. not going for early asteroid mines). It is not about what the AI may or may not be doing now. So I do not understand what overall point you are making about "results" in this context. 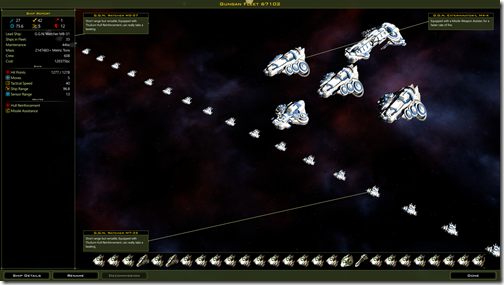 -> so SD, will dedicate some ressources to teach the AI to grab more asteroid mines. At least I hope they will recognize it as an AI issue and not just nerf asteroid mines. My point is, sure, they can gather telemetry and start working on these things after that, but why bother? Why go through this just to diagnose things, which can be seen by a trained eye. I'm not saying these obvious things will make the AI as good as it can get with the telemtry. I'm just saying, they can start on these issues long before the telemetry data is in. And I am somewhat afraid they might miss the obvious issues alltogether. Thanks for the clarifications. I see your points better. Not that I agree completely, but that is unimportant. It is my reading that what you are talking about is already in progress. The AI is already constantly being analyzed and optimized and debugged as part of the ongoing development and support. Devs regularly scan the forums even if they do not reply as much as we greedy fans would like. They see issues and suggestions. What they then decide and prioritize is likely not to exactly match what either of us would choose, even if they really should follow our always excellent advice. Presently, that process is highly accelerated because Frogboy is indulging in his favorite obsession, AI development. This often involves way too much debugging to be totally fun. But full team effort was always in progress and will continue when Frogboy's attention is demanded elsewhere. I myself have never considered code development exciting before, but it is a constant surprise what progress is coming out of this burst of effort. Smarts, performance, serious use of high end rigs, changelogs full of tweaks and adjustments , all sorts of geeky goodness. Fun! I am enjoying having Frogboy go wild with the code. I have sympathy for the team that has to catch up with him, but hey, they knew who they were working for! I don't think the telemetry is meant primarily for debugging. I think Frogboy sees it as a tool he could use right now for some additional value, just because he looks at all software that way. I've known coders like that. They will pull out some software tool and change code out from under you and you will never know what happened, but suddenly, everything works better. Both scary and useful. The original impression of GalCivCrusade was the ai the and the game was better but the more i play the more i feel like something is terribly wrong. I have wasted around 30+ hours on crusade games with even taking away resources for weapons(for testing) just to have godlike AI 500 turns into the game still running basic weapons and defenses on all their ships. Having large/huge tech and still spamming terrible small ships. I read the forums and feel like im not even playing the same game as everyone else, or everyone else is not actually playing the game outside of early game. Are people really getting quality games from the AI on crusade? At least gc3 the AI would play more than half the game. In crusade i dont think the ai is capable of actually playing anything but early game. In crusade i dont think the ai is capable of actually playing anything but early game. I'm getting the same impression. The first ~50 turns are interesting but then after that its smooth sailing. I wish for an AI that would make a concerted effort to obliterate me. Invade me. Blow something up. Anything more than posturing. The two biggest AI challenges remain The extreme logistics system numbers,which it really struggles with and the way they implemented the ship design system. This weekend I improved on both which should show up in 2.3. (Opt in will come up soon). But it's a non trivial AI challenge. in GalCiv II I had the AI design it's own ships. In GalCiv III hey chose to use xml templates for some reason. I will probably be replacing that whole system eventually. But I think you'll find the ship quality in 2.3 better. Btw, if you unhide fow, it unhides it for all players. 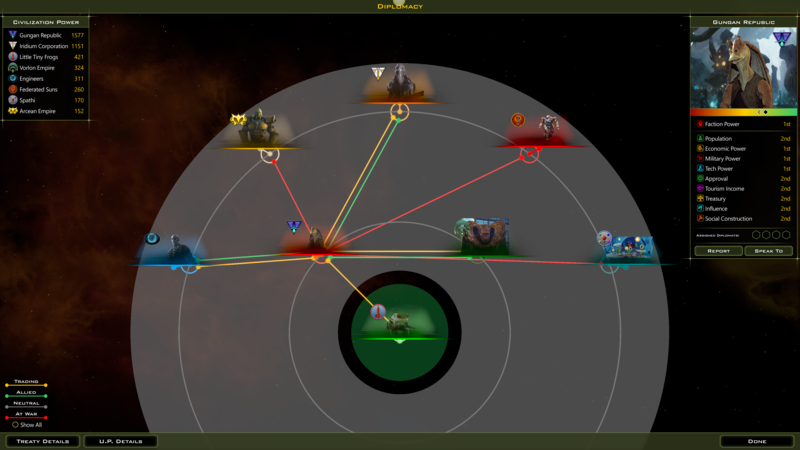 AI does not know where the good planets are or where your ships are. For 2.3 I let auto survey detect where anomalies are however for all players.